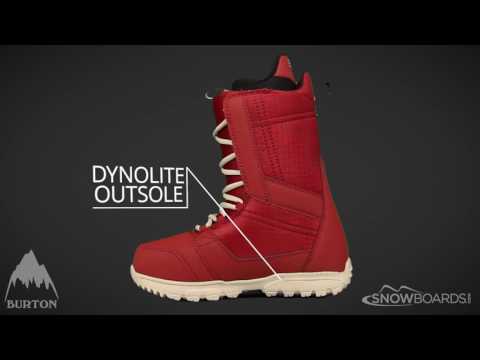 Experience a whole new level of comfort when you step into the traditional lace-up Burton Invader snowboard boots. Designed for beginner to intermediate riders, they are soft flexing with a Soft Flex Tongue to help minimize fatigue and enhance comfort. The lightweight and heat-moldable Imprint 1 Liner offers a totally customized fit, while Total Comfort Construction guarantees out-of-the-box comfort from day one. A Level 1 Molded EVA Footbed and DynoLITE Outsole provide maximum cushion and enhance board feel for stomping big landings. The Snow-Proof Internal Gusset ensures feet stay warm and dry even if you find yourself in deeper snow. Whether you're a beginner rider learning to link turns on groomers or an intermediate rider practicing your tricks in the park, the Burton Invader boots have comfort and performance to make everyday a great one.